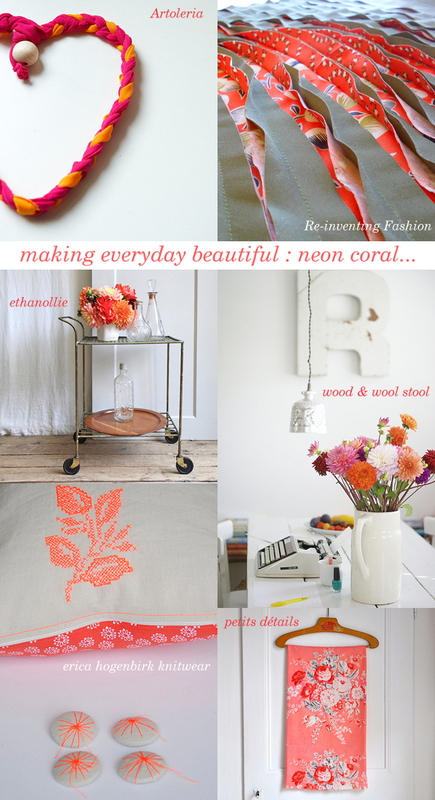 I wonder if I will ever tire of these super bright shades of coral pinks, neon oranges and glowing reds!? This morning they are absolutely perfect for brightening up this dreary Monday... so grey in Edinburgh today! Although if we take a lead from this wee selection of gorgeous images from 'making everyday beautiful', soft whites and muted linen greys are the perfect backdrop for these super brights. Today is most definitely a day for treating ourselves to a bunch of brightly coloured dahlias or getting a wee bit crafty with our neon fabrics and threads. Or if you'd like an even quicker fix of cheery brightness fish out your most favourite and colourful vintage fabrics from your collection, arrange them on a pretty vintage hanger and pop them on your wall for an instant burst of inspirational colour! Thanks for the brightness Emma, grey here too! Hello! I'm a great fan of Artoleria's creations! These images together are very inspiring!